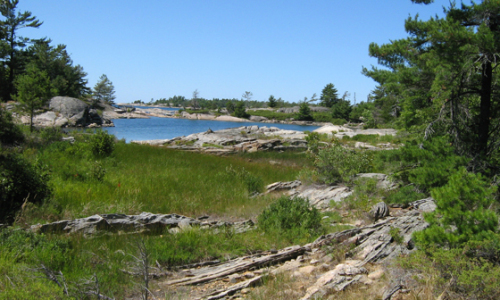 The Martin-Duncanson Reserve is located at the north end of the Go Home Bay community. The property has an extensive shoreline supporting a network of wetlands. Some of these wetlands extend inland via sheltered bays. Due to low water conditions, much of these areas are exposed with zones of vegetation corresponding to changes in water levels both seasonally and annually. Vegetation types range and species diversity is high, including emergent, floating and submergent plants. Some portions of the wetland support a large population of a provincially rare, Atlantic coastal disjunct species, Carolina Yellow-eyed Grass (Xyris difformis). The upland habitat is a mosaic of exposed barrens with scattered shrub cover, including Red Cedar (Juniperus virginiana), and open White Pine-Red Oak-Red Maple forest. The forest community is known to support hawk nesting and the owners and nearby cottagers regularly observe Eastern Massasauga rattlesnakes and several other rare reptiles throughout the area.